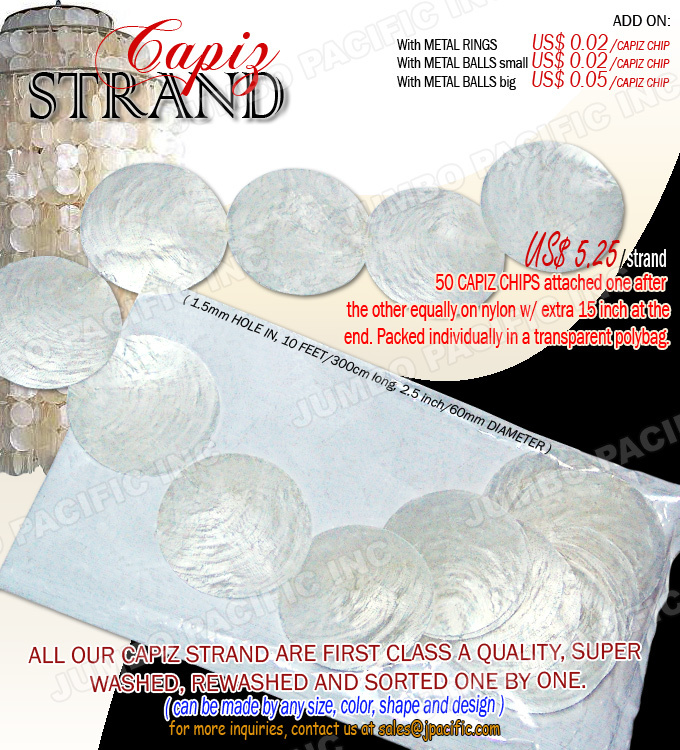 Description:60 Capiz chips in strand, 10 feet/300cm long, 2 inch/50.80mm diameter in round shapes with extra 15 inch nylon. Available in any colors and shapes. Description:5 feet/150cm long, 2mm hole, 38 Capiz chips in 35mm diameter chips with metal rings attached one after the other equally with extra 5 rings at the end. 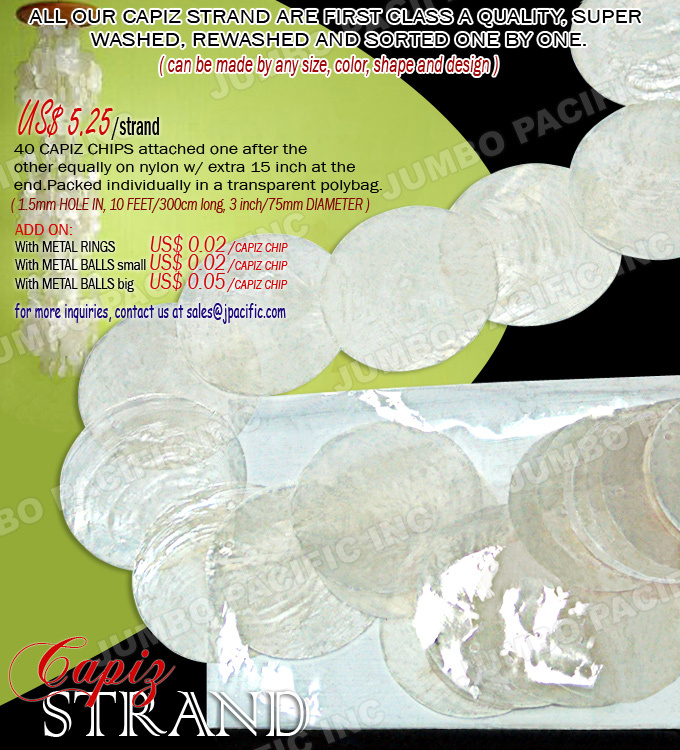 Packed individually in a transparent polybag. Available in any colors and shapes. 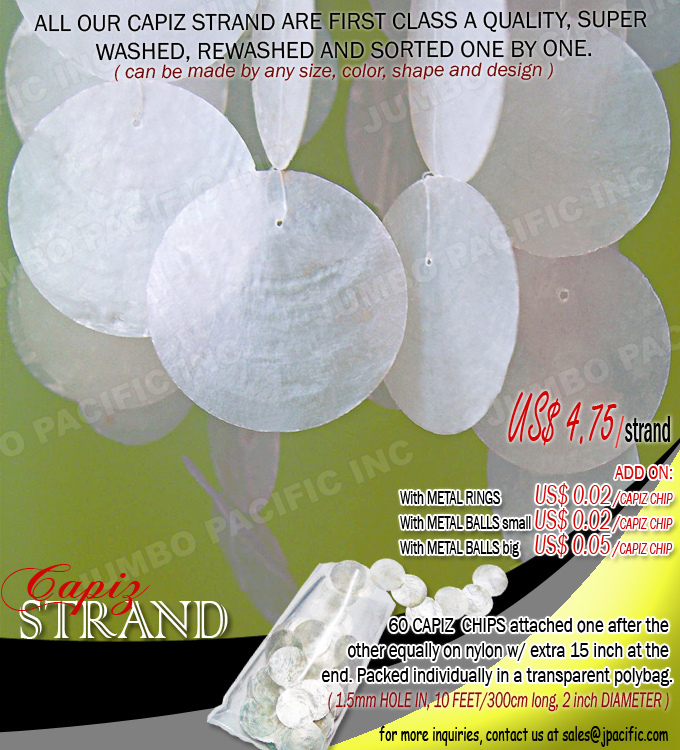 Description:10 feet/300cm long, 1.5 mm hole, 50 Capiz chips 2.5 inch diameter in round shapes on nylon with extra nylon 15 inch at the end. Available in any colors and shapes. 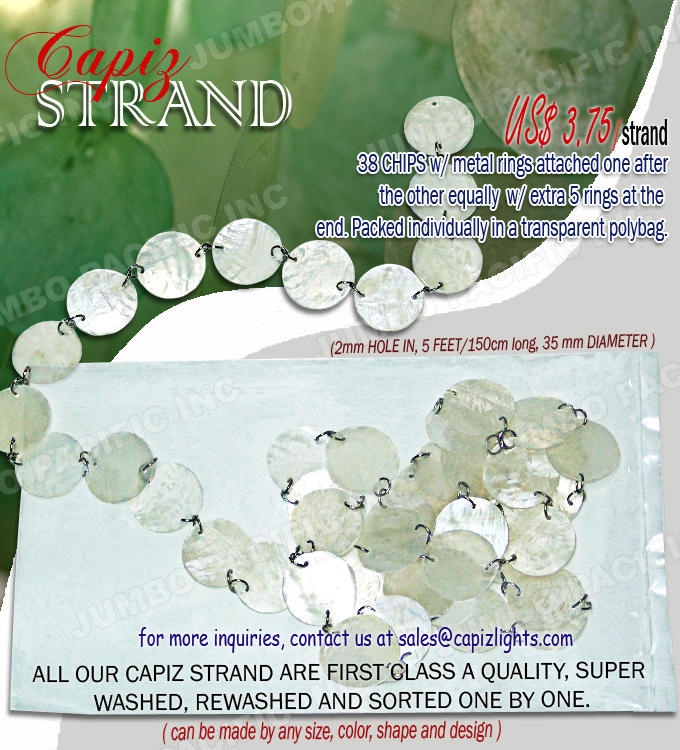 Description:10 feet/300cm long, 1.5mm hole, 40 Capiz chips in strand 3inch/75mm diameter in round shapes. Available in any colors and shapes. 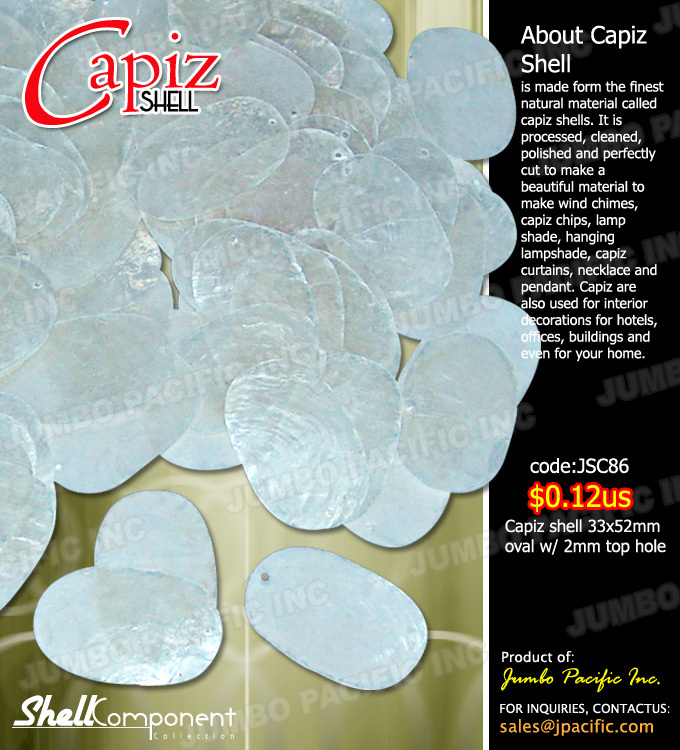 Description:Capiz chips 33x52mm oval with 2mm top hole. Available in any colors and shapes. 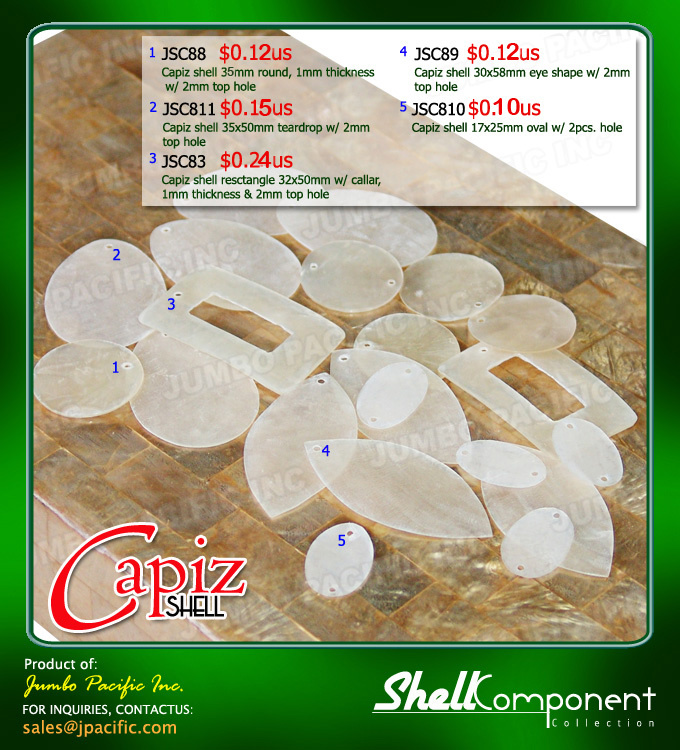 Description:Capiz chips 50mm diameter in round, teardrops, rectangular, eye-shape and oval shapes with hole or without hole. Available in any colors and shapes. 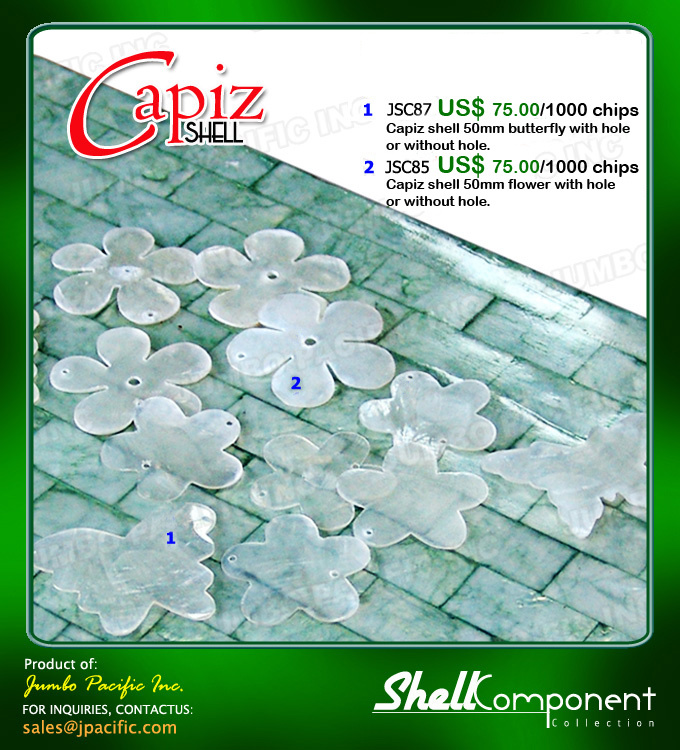 Description:Capiz chips in butterfly and flowers shapes with hole or without hole. Available in any colors and shapes. 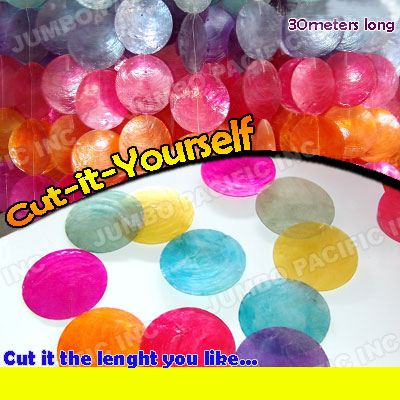 Description:Cut it the lenght you like Colored Capiz chips 2.5 inch (60mm) diameter - 1.5mm hole in 98.43 feet (30 meters) long no less than 500 colored CHIPS attached one after the other equally on nylon, 3 nylon strand 10 meters each with extra 15 inch nylon at the end (more available on demand)., Each strand packed individually in a transparent polybag.